Energic first prototype that made production 4 RM system. 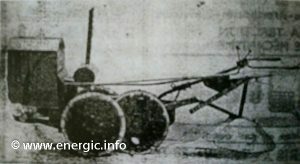 Finally uncovered a photo of a Energic motoculteur/prototype with plow. From the height of the bonnet it was a OHV, over head valve, moteur. 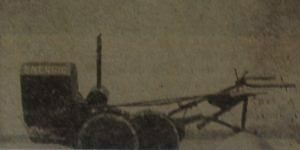 More than likely the engine found in the Energic motoculteur type G9, the 500cc Chaise OHV available in 1927/1929.These motoculteurs where of a 4 wheel drive system, with solid disc wheels, With its overall width approx. 40cm – which was the standard width/distance between the rows of vines. Also within the design was a blockage system, to prevent wheel slippage,which operated by locking apposing wheels on apposing axles. Engine/Moteur. 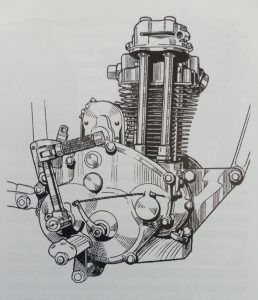 Single cylinder, air cooled,four stroke over head valves using a Chaise engine sourced directly from motor cycles. The G9 develops 9hp (CV). Exhaust. Vertical from cylinder muffler first stage box. Made from steel. Operation/Gears. 2 levers operating- forward/back and the other 3 gears. Wheels/drive. Solid disc construction, with the frontset being wider than the rear. For weight distribution and drive on all 4 wheels. Fuel tank. Integral under the bonnet. Cooling. By fan operated from the engine sides, through ventilated circular ports – grill wire protected. Equipment. Plough suspended by a independent arm from the chassis. Mr Patissier was contacted by a friend/viticulturist who purchased a early motoculture from Paris in 1929, who unable to successfully run a new type of motoculteur and was frustrated by its limitations. Mr Patissier analysed the machine, and it became evident that it was impossible to modify sufficiently to increase efficiency and to over come the problems inherent in this basic design. 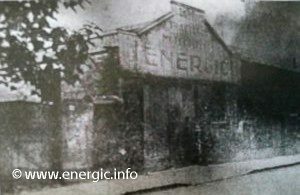 So he set about constructing from a new base design a limited range of motoculteurs that would be more suited to the purpose of polyculture, maraîchage and viticulture.Three machines where built under the brand name “Energic”. 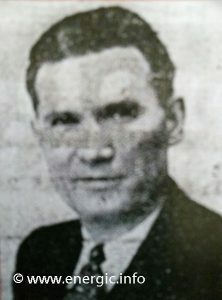 Mr Albert Patissier founder of the Energic Brand. However these motoculteurs also had there draw backs, difficult to steer, poor lateral stability, poor turning circle for the small parcels of land used by the viticulturist. Some 28 motoculteurs where produced, of this design, and 12 where sold.The size of the machine was dictated by the viticulters requirements to work on small parcels of difficult terrain, mainly on hill sides. In the Lyonnaise area. Before any more where sold, Mr Patissier, at his own cost, recalled these faulty designs motoculteurs on the understanding that he would correct them fit for purpose.This was a very generous thing to do and fiscally very risky, as his fledgling company had meager resources. This was make or break for Mr Patissier and the fledgling Brand Energic! It actually became was the bedrock of the Energic companies work ethic moving forward, trust, honer able and honest using the best materials available with the latest technology. These first motoculteurs where replaced by what we recognize as the Energic B, and C ranges of the future. Also interestingly the colour changed from the original blue, to red with all 2 wheel drive machines of that date. (information from archives supported by Mr Jean Fleitou – who worked for Mr Patissier from the first machine production till 1967).